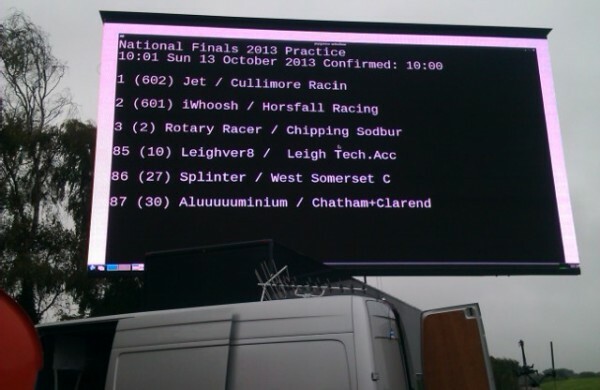 Building the world’s biggest Raspberry Pi display? @RaspberryPi #piday #raspberrypi « Adafruit Industries – Makers, hackers, artists, designers and engineers! It’s been a while since I wrote a blog about a project, mostly because I’ve been very busy with my day job. However, I thought I would break”radio slience” and write this one up, because it was huge fun, and also I think parts of it might be of use to others. One of the things I often get asked in my role as a STEM Ambassador, is ”What’s it like to be an engineer”. I’ve thought about this a lot and honed my elevator pitch quite a lot now, but there is one phrase that always comes out “It’s a huge lot of fun, and hard work”. I certainly had a lot of fun and did a lot of hard work (at the last minute!) putting this one together. The program was finished 11pm Saturday night, I boxed it all up, went to bed, got up at 5.30am Sunday and drove to Goodwood to install and run it. But it all worked in the end! Here’s the story of how I got involved in this project, and the steps involved in putting together the world’s largest Raspberry Pi display.